Rethinking the Mantis Repstrap. | Capolight Electronics Projects. ← How to use cad.py. The Mantis CNC is a well thought out and very easy to construct PCB mill. Unfortunately, as it was originally designed as a PCB milling tool its build area is very restricted both horizontally and vertically. Because of this, and a few other small problems I have encountered over the past week of playing with a mantis inspired repstrap, decided to build a new repstrap with a few improvements. Has a print area of 200x200x100mm. Has a heated print bed. Has a manually quick swappable extruder/cutting tool heads. Is constructable with only basic tools. Only requires parts found in domestic printers and scanners. Is easy to access for cleaning and maintanance. Has a viewable window that can be opened. Has a entirely contained heated build chamber with a maximum temperature of 100 Degrees C to increase part quality. Obviously it is the last dot point which will be the hardest to achieve. At 100C any thermoplastic components will be softened enough that creep will become a real problem. Also it will put real stress on the stepper motors, which are rated to only 40C. In order to (hopefully) solve these problems the build will go against the reprap theme and not be constructed using low temp thermoplastic. Even the Wade’s extruder will be a polyurethane resin cast, which is usable at 100c. To try and protect the stepper motors they will be contained outside of the build area and exposed to the ambient temperatures only. This is of course all stepper motors apart from the extruder stepper, which must be within the build chamber. To protect the extruder stepper motor it will be insulated and then cooled with a peltier(wiki link). If you find the wikipedia entry too heavy going, then take a look at this less physics based description instead. On ebay there are currently Peltiers rated for 230C , however I cant find much detailed information on them. This is far from the most efficient design, but I think it should work maintain a safe temperature for the stepper motor. Though more research is required though before I commit to this idea. The old repstrap design on the left, the new one on the right. The x, y and z stepper motors are located outside of the build area. Like the original repstrap, it will be constructed from plywood. The glass doors on the front will open by folding up on hinges until they lock into place on the top with felt covered magnets. The new repstrap with the glass doors folded up. If more access is needed to remove printed parts or swap out an extruder then the sides with handles will also fold down on hinges to open up the print area completely. The new repstrap completely open. However, even when closed up there will still be a 20mm wide gap where the Z extension bars move up through. My hope is that I can use bristles from a brush to stretch across the gap but still allow the rods to move freely from side to side. The heated bed will be based on nophead’s 290W proven design using this aluminium clad resistor. My hope is that the combined heat from the extruder and the heated bed will be enough to heat the chamber alone. Here is a close up of the extruder and z-axis. I havent drawn in the sliders in this image. The extruder was imported directly from the stl files and scaled so it should be the correct size and shape. 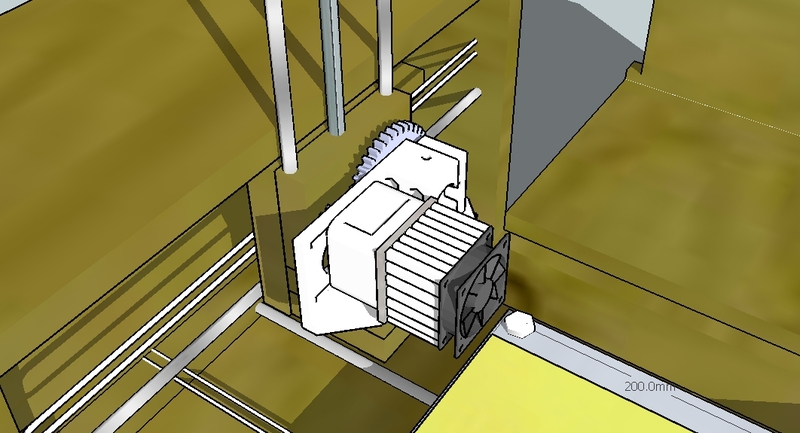 The heat sink and fan is coupled directly onto the hot size of a Peltier and the cold side would be directly coupled to the stepper housing, which would be insulated. I’m not sure if the fan cooling for the hot side of the peltier heat sink will survive for long at 100C+. If not I will need to build something custom. If you want to take a closer look at the model you can download a copy from the google 3d warehouse. 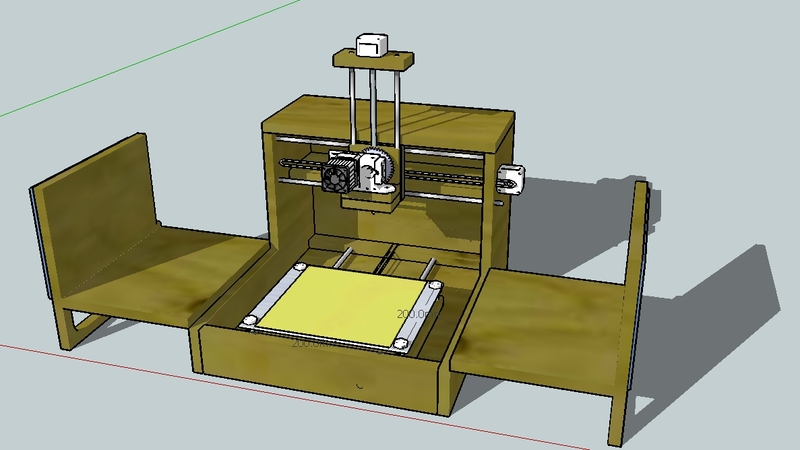 This entry was posted in 3D Design, A Reprap Project, Gunstrap and tagged heated bed, mantis, reprap, repstrap, sketchup, wades extruder. Bookmark the permalink. 12 Responses to Rethinking the Mantis Repstrap. i dont think you need to get your chamber up that hot even just up to 50 or 60c would be more than enough, at 100 i think all the plastic will start to get too soft for you and you may run into allot of other issues. Excellent idea! I have been thinking for some time that the heated beds are only a partial solution to warping. I believer larger builds will require a heated chamber. I am concerned that at 100°C ( half the temp of a pizza oven) you will have a real struggle with heat loss. (Mike may be right that 100°C is not necessary, but I think the capacity will be necessary for experimentation.) I think you should plan some kind of gasketing for joints. I also think that the 20mm slot on top will be too lossy, even with a brush bristle cover. Getting rid of that will bring the Z stepper into the heated volume, as well as increasing the volume that needs to be heated. I think this has higher chances of success for effective heating of the chamber though. Here’s how I think you can deal with steppers in the heated volume: Enclose them in a cold chamber within the heated chamber. Feed ambient temperature air to them through flexible tubing. I’m thinking something like vinyl dryer vent hose. The stepper should probably have a heat sink mounted. A fan drawing air from outside the heated chamber should blow through the heat sink, and this air should be exhausted back outside the heated chamber. 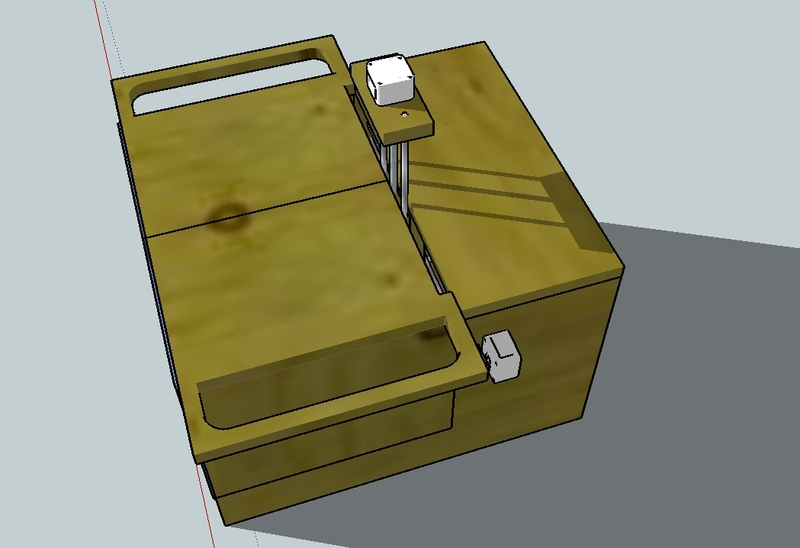 Some rearrangement of the Z axis could possibly put both steppers within the same cool chamber. However you proceed, please succeed. I want to print big parts too. You don’t need 100 Deg C.
Also, you don’t want the area completely sealed. Remember that the extruder will also be pushing heat into the build area, even if it’s only a small amount. This adds to your total amount of heat. You also need to vent gases of extrusion from the box as well. You can use a fan directly to extract them, or positive pressure to force it out gaps (which, if you’re got gaps is probably the best way). 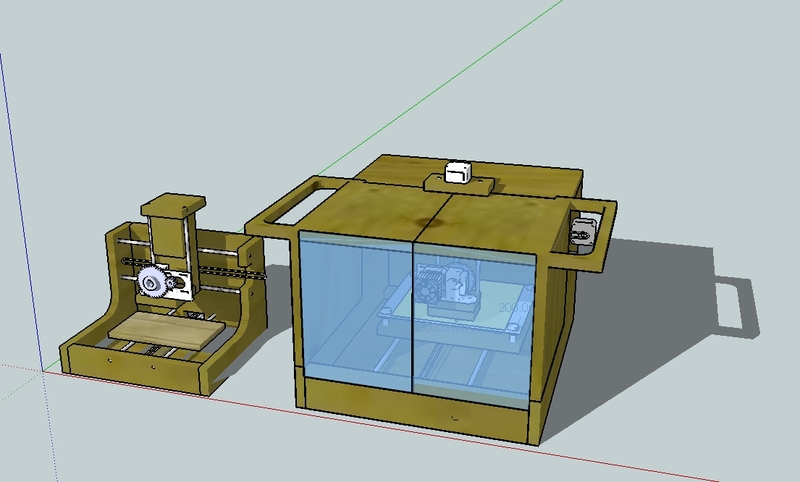 Maybe there is more elegant approach to heated build chamber. If you use XY stage on top of build volume and Z table inside, you can probably isolate XY stage, cold part of extruder and stage motors using roller curtains/bellows. Then the top could be cooled using fan (or left open to ambient). Z stage could be similar to darwin, timing belt and motor separated from build chamber. Then only nuts and platform will be in heated area. Thanks for all the comments, they have given me a lot to think about. So the general consensus is that 100C is not required. Even so, I would still the like the ability to get up in that region for testing purposes. What is the optimum temperature for printing at? 60C? 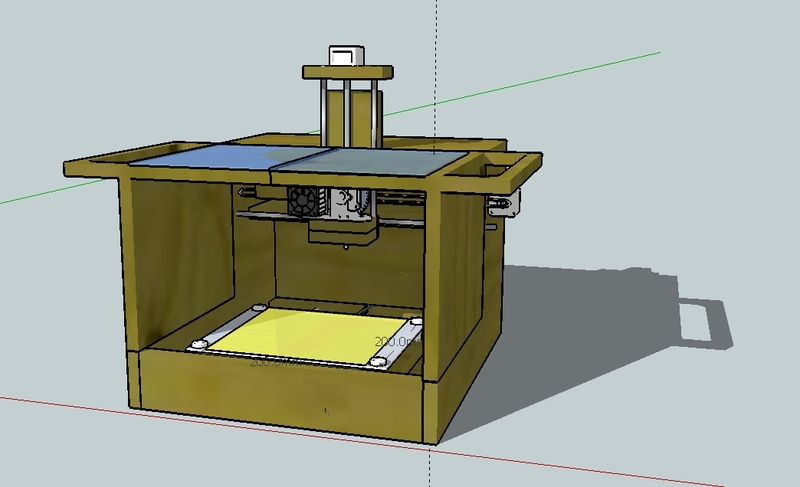 I also really like the idea of the Bowden extruder. This is something I will be sure to look into once I have a working printer and can track down some PTFE tubing. Oh and Cefiar, I plan on using a negative pressure system so that air enters through one of the (many) gaps and is forced out the window in a similar systems to Nopheads. 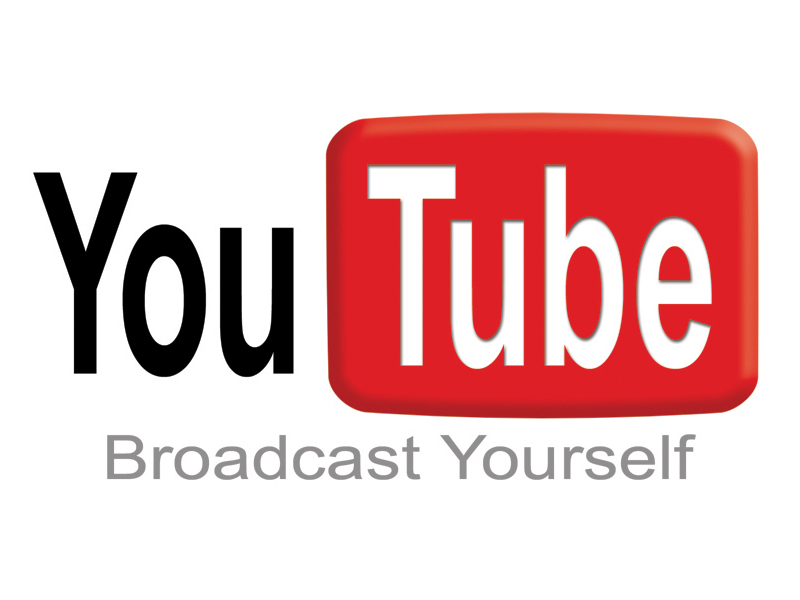 Thanks for the link, lots of interesting videos on there that I would never have found otherwise. Edit: I just got up to the part where he describes the blower tube for the print head. This is the same idea that Dale Dunn suggested for keeping the extruder stepper motor cool. All of a sudden my Peltier idea is looking a little wasteful and unnecessary. Not to mention expensive. Have you considered using a CPU liquid cooling solution to cool your extruder motor? You would just need to make sure that the lines carrying the coolant from the heatsink on the motor out to a radiator outside the hot box are flexible enough to handle the amount of moving the extruder will be doing. Thanks for the suggestion, that’s something else to consider. Nice combo, using a mantis frame for a repstrap. I’m not sure if it is the best choice though, as you will be lugging that z-axis around all the time. The mass of the moving parts is a limiting factor now, especially sine the reprap firmware does not have acceleration limiting. You should have a look into the Ultimaker (www.ultimaker.com) bot, it has no moving steppers, only the hot part of the extruder is moving. And it is moving very fast. The build volume is even larger than your specs (20x20x21), in a volume that is about 35x35x40 cm.